Monday afternoon I went to the Georgia Aquarium, where I was going to swim with Whale Sharks! To say I was excited was an understatement! I have wanted to do this for several years, and I decided this would be my Christmas gift to myself. The Georgia Aquarium has the largest aquarium tank in the world, and is home to four whale sharks and four manta rays. They purchased their whale sharks from the Taiwanese fishing trade, where they would have ended up in the fish market – Taiwan at the time had quotas on whale shark fishing, so they wouldn’t have been able to just catch more after selling their sharks to the aquarium. But I digress. Before my swim in the late afternoon, I had a chance to see all of the exhibits. They had a really cool tropical reef exhibit, complete with wave action. I enjoyed watching that one for awhile. They also have a bunch of penguins and puffins, doing penguin and puffin stuff, seahorses, sea dragons, and otters. The otters moved constantly, so it was impossible to get a non-blurry photo of them. The dolphin exhibit was closed when I was there, but I wasn’t too disappointed since I had the opportunity to swim with wild dolphins in Hawaii last year! As a complete aside, did you know there is a Chocolate Chip Sea Star!?? The aquarium has a couple beluga whales, and two albino alligators! Pirahnas, longcomb sawfish, Black Reeftip sharks, sea turtles, green sea turtles, cownose rays, and all sorts of other fish. The Ocean Voyager exhibit alone has an astonishing number of fish; the tank contains 6 million gallons of seawater! You can see all the different animals in the Ocean Voyager tank. It is a nice aquarium. I checked in for my swim at about 4 pm; we were going behind the scenes at 4:30. I was so excited! There were 8 of us total, and we were paired up into buddy pairs. We were led back into the back area to check out the tank – it was interesting to see the tank from above! Did you know they have machines that agitate the water and spotlights at the surface so you can’t see what’s going on up there when you are looking at the fish from below? We were fitted with our wet suits, gloves, booties and snorkels, and then headed into the dressing room to get changed. Those suckers are really hard to wiggle into, just so you know. Once we were dressed, we went back out to the surface of the tank, and they explained all the details. We were to swim very slowly, mostly just occasionally paddling with our hands, to move in a lazy figure 8 around the tank. The whale sharks stay near the surface, and they tend to swim close to the walls of the tank, so that’s where we would be. We were told that we shouldn’t touch them, but we didn’t have to move away if they brushed up against us! We got into the water and headed out, being wrangled by a lead diver and another bringing up the rear, in case we went astray. A third diver was in the water getting video of the fish, and all of us. The water is 76 degrees, which gets cold after a bit! This was an amazing experience. The whale sharks are so big and so gentle! Being in the water with them was like one big, long WOW! I literally said “WOW!” over and over again through my mouthpiece. The manta rays move more quickly and come right up underneath you! During the swim, one whale shark swam right underneath me and brushed my abdomen with her back and dorsal fin (I think they are all females). None of the manta rays touched me, but they did brush against a few of the others in the group. The water is really clear, so you can see all the way to the bottom, and can see the other fish swimming. The Cow Nose rays, the Longcomb Sawfish, the Blacktip Reef Sharks, and countless other types of sharks and fish were all just moving below you constantly. It was so cool to see from this vantage point! The aquarium has a tunnel through the tank where the other swimmers’ family and friends could watch – it was interesting to see them standing down there under the water! It is absolutely one of my favorite experiences so far in my life – I had so much fun doing this! An added bonus was the fact that my swim coincided with an evening where they were switching over the computer software for the cash registers. Since the registers were shut down for this, they gave each of us a video of our swim for free! Normally you have to pay – it was an unexpected treat! After the swim, I walked back to the hotel (in the only pouring rain of the trip), and brushed out my wet hair. I was hungry, so I headed right back down the block to Ted’s Montana Grill. Ted’s is a chain, founded by Ted Turner (of CNN fame) and specializes in bison with a Western Saloon theme. I had a delicious mushroom Swiss bison burger, with pickled cucumbers, and tomatoes drizzled with bleu cheese and balsamic. It was sooooo gooooood… I also had some Bison Ridge Merlot wine, which I believe is another Turner project – it was a great wine! The meal wrapped up a fantastic day! Cost: $45.95 for general admission during peak hours (there are significant discounts for online pre-purchase, early or late arrival, groups, etc, and it is included on the CityPass). Swimming with the Whale Sharks (called the Journey with Gentle Giants) was $233.95 and included aquarium admission, the swim, a t-shirt, and a sticker. There is also a dive option for certified SCUBA divers. Upon leaving Canyonlands, we had a little bit of time before we had to make the long drive back to Salt Lake City. 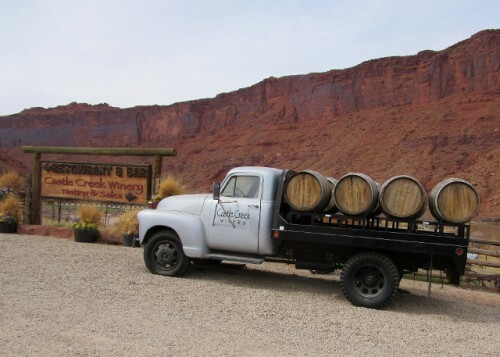 And it just so happens that a little way outside of Moab is one of Utah’s few wineries! I wanted to go! 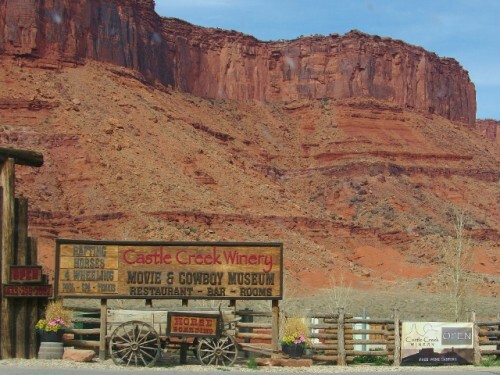 Castle Creek Winery is located 14 miles up Highway 128, a scenic drive along the Colorado River. It also happened to be the route of most of Jon’s half-marathon the previous day, so I had the opportunity to see what he was up against. There was a long… uphill section that looked really tough! There are lots of campgrounds and trail heads along the highway that look like they would be perfect for exploring – if only we had more time. 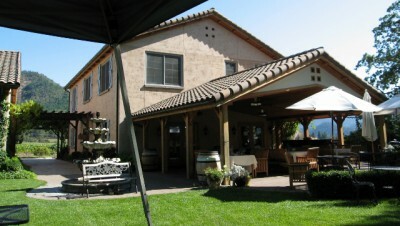 The winery is on the grounds of a resort ranch. You can stay there, and it looked like activities included horseback riding, swimming, rafting, hiking, and of course, the winery. There is also a museum on the grounds that we didn’t have time to check out. Our tasting was interesting… A complimentary tasting included 5 samples, which let us taste all but one of the wines. They were decent but not complex, fine for everyday drinking but they wouldn’t hold up to age. None had much in the way of structure or tannins. But that isn’t what made it interesting. Our server did that all on her own. She was nice enough, but was an older lady who was very worn – I didn’t smell smoke but she had the look (and the voice) of a ‘several-pack-a-day-for-several-decades’ smoker. I asked about the history of the winery, and her response was to urge us to go downstairs and watch the video. When we didn’t appear to be moving quickly enough, she kept prodding until we felt we had no choice but to go. Downstairs was odd. We found ourselves in a random cold, dimly lit hallway with glass windows facing out onto the dark production floor. And, as she promised, there was a 5 minute video explaining in extremely general terms the history of the winery and their production story. 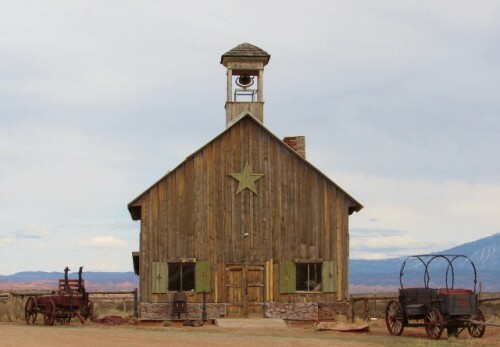 And because the winery didn’t inspire me to take any photos inside, here’s a photo of what I hope is an authentic historic school outside of Moab. I say I hope because it shares its parking lot with a gas station. In my last post, we checked out downtown Manistee – after our coffee we headed out to visit Douglas Valley Winery, just outside town. 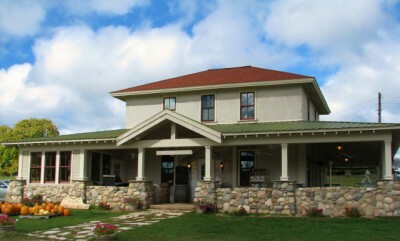 Douglas Valley’s tasting room is located in a historic building – an old bunk house along the railroad line at the turn of the century. 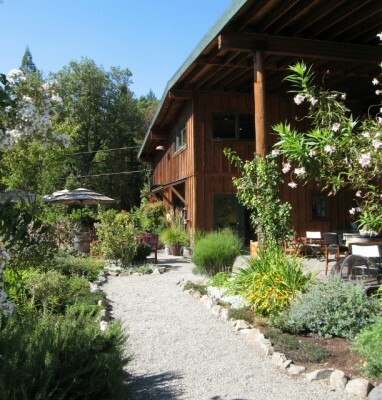 The property is surrounded by apple orchards and vineyards. UPDATE: My Dad, who grew up on a farm, let me know that the photo above is not a wagon. 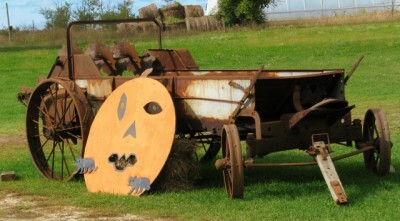 Rather, it is a manure spreader… So don’t go on a hayride in it, mmm-kay? When we arrived, there was one couple wrapping up a tasting, and then we were all alone with our server. Tastings are normally $5 per person for 7 tastes (including a souvenir glass), but we had a certificate for a free tasting thanks to a prize from the Michigan by the Bottle blog. You can also opt for 2 complementary tastes, but $5 is very reasonable. Bunk House White – A semi-sweet blend of un-oaked Chardonnay, Vignole, Riesling and Pinot Gris, with flavors of apricot and peach. 2013 Lakeview White – A semi sweet blend of Chardonnay and Riesling. Bunk House Blue – A tart blueberry wine with spice on the back of the palate. One of my favorites. Bunk House Cherry – A sweet blend of tart and sweet cherries. Also very good. Northeastern Sweet Red – A light, semi-sweet red wine; a blend of Foch and Chambourcin grapes. It had some Pinot Noir characteristics. Bunk House Red – A blend of Cabernet Franc, Pinot Noir and Merlot with flavors of raspberry and blackberry. Stone House Sparkling Cider – A low alcohol (7%) sparkling cider made with several apple varieties from the Douglas Valley orchards. Excellent. 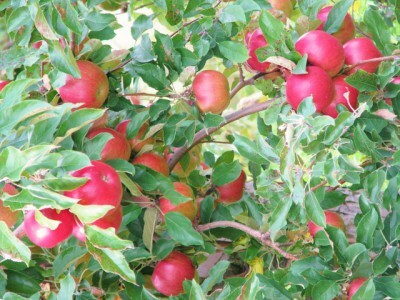 Stone House Semi Sweet Cider – A blend of Jonathan, Macintosh, and Northern Spy apples. Fruity with flavors of apple (duh…) and honey. Caramel Apple Cider – One of two specialty ciders that they had on tap and available for sale in growlers, this had a nose of heavy caramel, but the caramel flavor was very light on the palate, with pleasant, light bubbles. Our server was very friendly and offered information about the wine, and the history of the property. Currently Douglas Valley grows the fruit and grapes, and the winemaker from another Michigan winery, Black Star Farms, makes the wine. I think there is a plan to begin making their own wine at some point in the future, but this method seems to work well, as there were several good wines. Douglas Valley also had a large selection of local food products, and since it was close to lunchtime, we decided to get a picnic lunch to go. We picked out some Great Lakes tortilla chips, beef jerky, cajun beef jerky, Michigan made jalapeno pickled asparagus, asparagus salsa, and a big bag of fresh Winesap apples. We said our goodbyes and headed out on our way to our next destination – Sleeping Bear Dunes National Lakeshore. En route, we found a roadside viewpoint with a picnic table and enjoyed our picnic lunch. The weather was still cold, but had warmed up enough to allow us to sit outside for 20 minutes and enjoy our chips and salsa, beef jerky and asparagus. What a great lunch! 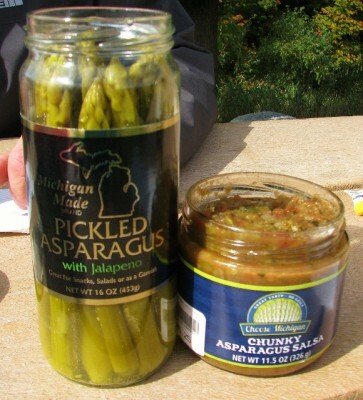 A few of our Michigan Picnic Lunch items – YUM! But we couldn’t linger too long, because I couldn’t wait to see Sleeping Bear Dunes! After our visit to Jacksonville, Oregon, we decided to check out a couple of wineries! The Applegate Valley is one of the most overlooked wine regions in the country, with outstanding wines and a quiet, relaxed atmosphere. Our first winery stop was Wooldridge Creek Winery. We pulled in to find an amazing covered seating area with cushioned patio furniture, a classy yet inviting tasting room with several books available to read, and another outdoor patio with tables and chairs. Jon’s dad wasn’t interested in wine tasting so he plopped down outside in the shade to read his book. The winery named after the Wooldridge family who first settled on the property in the 1850s – this isn’t the same family that owns the property and the winery now though. The first grapevines at Wooldridge Creek were planted in the 1970s; it has now expanded to 56 acres planted in twelve varieties: Cabernet Sauvignon, Merlot, Cabernet Franc, Syrah, Chardonnay, Pinot Noir, Viognier, Sangiovese, Zinfandel, Malbec, Petit Verdot and Tempranillo. However, until 2002, the owners sold all their fruit to other wineries; at that point they met and partnered with a wine-making couple to start the winery. We began our tasting in the tasting room, but soon the draw of the warm sunshine was too much. Our server was very gracious about loading up our tasting on a tray with mini decanters and tasting information for each wine. As I think back on it now (on a gray, rainy day in frigid January), I wish I were back there soaking up the warm rays of the sun! The wine was delicious – I did find that I liked the reds more than the whites though. The French oak aged Chardonnay was a hit with Jon, but a little too oaked for my taste – good for a taste but too much for a whole glass. There was a Viognier that was quite enjoyable – which was a bit unusual because I don’t typically like many Viogniers. Jon’s mom really enjoyed that one. The reds were wonderful – balanced and approachable while still having lots of structure. We tasted Merlot, Pinot Noir and Malbec. After Wooldridge, we visited Troon Winery. Jon and I had been there before, and Jon had wanted to go back. We wanted to be outside again, so we shuttled back and forth between the tasting room and the seating area outside. That was a little bit awkward, but it was to be expected as the server had her hands full with other customers. She did tell us a bit about each wine when we came in to get our sample, but it seemed a bit more impersonal than our visit in 2011. That said, Troon’s wine is excellent – not a bad one in the bunch. Ironically, when we visited in 2011 the Druid’s Fluid red blend was my least favorite wine, but it is the biggest seller for the winery. This year, they didn’t have Druid’s Fluid on the tasting menu, so I don’t know if I would have liked it more now. We ended up getting several wines to bring home with us. For some reason though, I always forget that Troon now has a tasting room in the Willamette Valley, so we will have to stop by there sometime when we are down that way. After our two tasting room visits, we wrapped up our day and headed back to the rental house to enjoy one last quiet evening on the river before heading home. 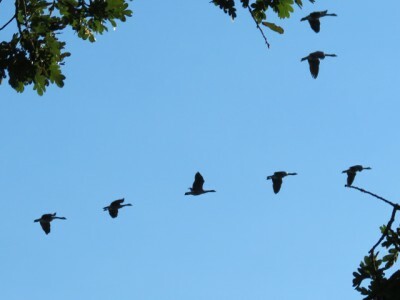 We swam in the pool, read books, watched the Canada Geese flying overhead to their night roosts, and heard the hum of the jet boats as they took tourists back home after the dinner tour (I so want to take that jet boat tour one day!). We had to be up before dawn in the morning, because Jon had misunderstood what days he was supposed to get off from work. I had planned for us to spend a leisurely day Tuesday driving home and then go back to work Wednesday, but Jon thought we were coming home on Monday. He had scheduled himself to work at 2 pm on Tuesday, expecting that he would have a quiet morning at home to sleep in and get some things done. Obviously that wasn’t going to happen! Considering that the drive home (without traffic) is 8 hours, we set the alarm for 3 am to get home in time. I’ve been in a wine rut. Our travel this year hasn’t been wine focused, so we haven’t sampled very many new wines during tasting room visits. In looking at the wine we have around the house, most of it is higher end Washington wines and Oregon Pinot Noirs. While I love Pinots, it isn’t every random Wednesday that I want to open a more expensive bottle. And trips to the grocery store leave me wandering the wine aisles, not able to get excited about all of the wines I’ve had before, and uncertain about trying something new. So I had an idea. I popped down to the local wine shop this afternoon and told the owner that I had a challenge for him, should he choose to accept. I have been pleased with all the recommendations he has given me before, so why not trust him again? The challenge? Put together a mixed case of wines I have never tried. 8 or 9 reds, 3 or 4 whites. That’s it – no other rules. If he offered it, and it fit within the parameters, it went into the case. Of course he accepted, because what wine aficionado wouldn’t? Here’s what I ended up with. My Mixed Case of Wine – my descriptions below begin with the wine on the left. So there’s the line up. I can’t wait to start sampling. Have you had any of these wines? Which one do you think we should open first?